For those struggling with homelessness and housing stability, there is never an easy solution. In her 9/29/15 piece, Time running out on Seattle family’s ‘golden ticket’ to landing a home, Seattle Times reporter Nina Shapiro follows Dana Disharoon, a single mother of three daughters and survivor of domestic violence, in her recent search for permanent housing. Following months of moving between shelters and her car, Disharoon was able to live for a year in transitional housing at Solid Ground’s Sand Point Family Housing. As her time there ran out, Disharoon attempted to secure a permanent residence, aided by a Section 8 housing voucher and Solid Ground case managers, but was hindered by a low credit score and the aggressive competition in the housing market. Since the article was written, Solid Ground’s Sand Point Residential Services Manager Tamara Brown reports that Disharoon and her daughters have successfully located housing, and are now waiting for a final inspection before they can move in. 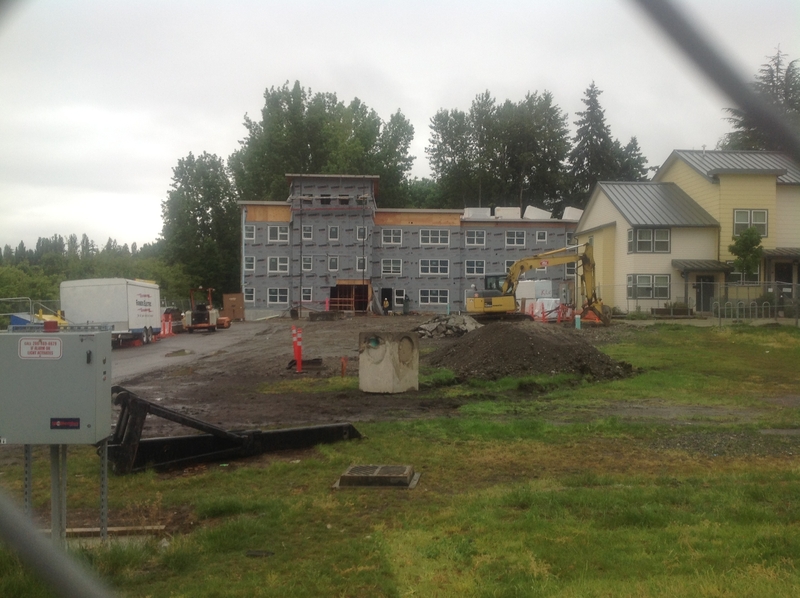 Sand Point Family Housing will be assisting with move-in costs. A few weeks ago, a gentleman called Financial Fitness Boot Camp (FFBC) asking questions about budgeting, as well as how to pay off a huge credit card debt and a student loan. He is living in a transitional men’s shelter until April 2016, paying $465 a month for rent. He stated that he wants to move out of the shelter and live in his truck, and use the rent money to pay down his credit card debt. We asked him to come in so we could do a budget and look at the expenses he might encounter living in his truck. After doing some research we found it would cost more to live in his truck. In addition, living in his truck could lead to the development of chronic health issues; imagine trying to sleep in a small truck with a height of 6’5”? He would use more gas as he moved from street to street. He might receive parking tickets which could lead to being towed. He would have to eat most meals out as he would have no food storage or way to cook food, and in addition, have no access to a bathroom, laundry or electricity. In order to stay warm in a truck that has no insulation, he would have to buy blankets and warm clothes. And lastly, he would have to make the costly move to put most of his possessions in storage. When he came in for our meeting, he was very pessimistic. He was feeling hopeless and stated he was having a hard time holding on emotionally. Our Financial Fitness Coach Judy Poston showed him how his monthly expenses could easily more than double by moving into his truck. After we covered this information, he felt better able to weigh the pros and cons of living in his truck and make an informed decision. He said because we put the information in writing, his options were more was clear. Before he left, he decided that he would stay in the shelter, save money and explore new employment opportunities. For more information about how FFBC can help you and members of your community, please contact Judy (financialfitness@solid-ground.org | 206.694.6776). We apologize for the late notice, but we’ve had to cancel this workshop due to staff schedules. We hope to reschedule within the next couple of weeks and will post here when we have a new date. Solid Ground Tenant Services is offering another opportunity for renters, housing advocates and service providers in King County to attend a free training about tenants’ rights and responsibilities as laid out in the Washington State Residential Landlord-Tenant Act. Since we are in the middle of the legislative session from January 13 to March 13, we will also provide an update on any potential legislation that our lawmakers are considering. You can advocate by signing a letter to send to your lawmakers to support the Fair Tenant Screening Act or other legislation that benefits renters! Whether you are a long-time renter who would like a refresher on landlord-tenant laws or a new renter who wants to know about your rights and responsibilities, we hope you will join us for the workshop! Email questions regarding the workshop or RSVP to tenantwa@solid-ground.org. The tenant information contained in this article or linked to the Solid Ground Tenant Services website is for informational purposes only. Solid Ground makes no claims, promises or guarantees about the accuracy, completeness or adequacy of the information contained in or linked to its website. Solid Ground cannot act as your attorney. Solid Ground makes no representations, expressed or implied, that the information contained in or linked to its website can or will be used or interpreted in any particular way by any governmental agency or court. As legal advice must be tailored to the specific circumstances of each case, and laws are constantly changing, nothing provided here should be used as a substitute for the advice of competent counsel. Solid Ground Tenant Counselors offer these tenant tips as generalized information for renters. People with specific questions should call our Tenant Services hotline at 206.694.6767 Mondays, Wednesdays & Thursdays between 10:30am and 4:30pm. Solid Ground’s ConnectUp (formerly Community Voice Mail) exists to keep people who are struggling to get by on low incomes and/or experiencing homelessness connected to support networks, jobs and housing opportunities via telecommunications access in King County, WA. Specifically, ConnectUp helps people access phone, voice mail, internet and other connections to the services they need. The program also does education and outreach on telecommunications assistance programs for service providers and people living on low incomes, and they broadcast information about community resources. The following story, “A Homeless Man and His BlackBerry: It’s not loitering if you’re on your phone” by Kat Ascharya is reposted with permission by Mobiledia (originally published 6/12/13). It highlights just how important staying connected can be to the dignity, livelihood and emotional well-being of people experiencing homelessness. You could tell he was different the moment he walked in the coffee shop. It wasn’t his appearance. He looked presentable, if a little rough around the edges, clutching an old BlackBerry to his barrel chest. It was how he moved: warily, shoulders hunched over and eyes darting. The body language would read as suspicious, if not for the flicker of fear and apprehension in his eyes – as if he was scared of being noticed, vigilant to his surroundings and desperately trying to blend in at the same time. He ordered a coffee, carefully counting out coins on the counter. He sat down at the table near me and pulled out his phone, just like nearly everyone else at the shop. 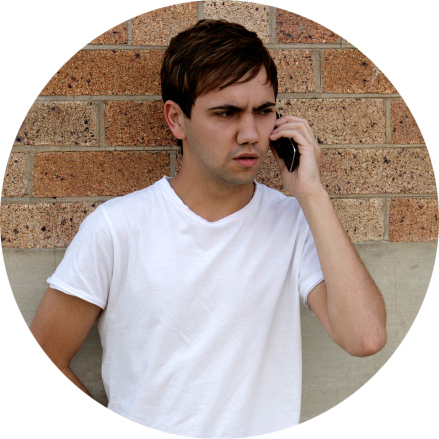 He punched in a few numbers and began talking in a low voice, discreet but urgent. I was only a few seats away, but I couldn’t help but overhear his conversations. Did someone have some cash jobs for him? Could he crash at a friend of a friend’s place? Could he get a ride out to the soup kitchen? After a few calls, it became clear: he was homeless. A homeless man with a smartphone. Bert isn’t unsheltered. He bounces between emergency shelters and friends’ couches while he seeks temporary, cash-based day-laborer work. He refuses, in fact, to call himself homeless. “This is just a temporary condition,” he tells me more than once, after we struck up a conversation. Over and over again, he said he would get himself out of “this tight spot,” though he was vague about how long he’d been in it and how he got there. He made it clear: he hadn’t given up. It wasn’t easy to engage him in conversation. When I first asked how he liked his BlackBerry, he looked at me like I was crazy. Later, he chalked up his guarded nature to the fact that he often doesn’t have casual conversations anymore. Most people, he said, tend to avoid him once they realize he is poor and transient. “You can’t hide it, being poor,” he said. He made a joke about people acting as if poverty was an infectious disease. They give him a wide berth and pretend he’s not there. “I can go whole days without people not even looking at me,” he said. “And when they do, it often means they’re sizing you up, wondering if they need to kick you out or something.” The result, he said, is a sense of exile, from any feeling of belonging you have to the human race. His phone, then, functions as an important conduit. On the surface, it’s his most important, practical tool. He can call places for work with it. He can call up shelters and other social services to see what’s available. He calls public transportation to find out which bus lines are running and check out schedules. E-mail and text is especially important. He can reach out to friends to see if he can crash with them for a night or two, especially if the weather is rough. But he has to be careful. “You don’t want to impose,” he said. “You can’t exhaust your friends. Otherwise they’ll get tired of helping you, thinking, ‘Why are you still struggling? '” The hidden worry is that you’ll never leave. Ironically, all this is easier to manage over text and e-mail than the phone. “You don’t have to worry about sounding upbeat and confident all the time,” he said. No one wants to help out the hopeless, and sometimes it’s not really so easy to disguise the worry and anxiety from your voice. Despite nearly everyone owning a cell phone, we think of them as luxuries, especially as data plans approach $100 a month. The idea of a homeless man with an iPhone, but no job or roof over his head, is discomfiting, mostly because poverty is perhaps one of the last bastions of unexamined prejudice in the U.S. Few would argue that people of different races or genders shouldn’t own phones, but it’s still common to temper sympathy for the homeless or destitute if they have a phone. Even the most progressive areas of the country can show a certain callousness to what poverty should look and feel like. In San Francisco, for example, city supervisor Malia Cohen sparked controversy when she posted a picture of a homeless man on Facebook, talking on a phone while huddled underneath a freeway overpass. “This kind of made me laugh,” she commented, which led to an uproar and eventual removal of the picture. Ironically, California last month decided to expand their Lifeline program to give free phones and service to the homeless, recognizing the value of the devices for the disadvantaged. The reality is homelessness is a simple term for a complex sociological condition, affected by a mosaic of factors that interact and affect one another in often unexpected ways. Large-scale trends like unemployment combust with local factors, such as lack of affordable housing or services easily accessible and open to those in need. Add in volatile personal situations – like addiction, family violence, financial instability or simply being far from family – you have a slippery slope to stand upon. The homeless themselves range from the “unsheltered” living on the streets to doubled-up families living in single-occupancy homes. That includes those in transitory housing or emergency shelters, as well as the famous 2004 case of a student at NYU who attended school while sleeping at the library and showering at the gym. About 20 out of every 10,000 people are homeless, according to the National Alliance to End Homelessness. Anyone without enough personal or social capital can get caught in the cycle, and it’s not easy to pull out, when you consider the tremendous shame and judgment they experience within themselves and from the world at large. But there’s one effective tool that can help. Yes, phones. On another level, Bert said his phone connects him to less tangible, but still important, resources. He knows people can reach him, no matter where he sleeps at night. He gets daily e-mails from an online ministry, with inspirational messages and passages from the Bible. Those keep up his spirit and faith and keep him going. He can read news on the browser, too. Ironically, his biggest criticism of BlackBerry is the browser: it’s slow and outdated and most websites won’t load on it anymore. He only gets a certain amount of time on the computer at the public library, so he often begins researching jobs and housing on his phone and makes a list of websites he wants to visit when he gets on a computer with a faster connection. The phone also, in part, structures his day in an often chaotic life. He has an exhaustive list of places to charge his phone, and he makes sure to hit them at some point during the day. He’s careful about his power and data usage and carries his charger at all times, in one of the capacious pockets of his army jacket. “When I see a free outlet somewhere, I have to say, it feels like Christmas,” he said. Free Wi-Fi inspires the same feeling; he can save up his valuable data usage. But the most valuable aspect about his phone, is simply that it makes him look like everyone else. “You won’t believe it,” he tells me, “but if I didn’t have my phone, I probably couldn’t just sit here and have my coffee and be talking to you. It gives me something I can do in public. It’s not loitering if I’m typing or talking on my phone.” Loitering, he said, is often a good excuse to kick the homeless out of a place. And a phone is a passport that lets him stay in places longer than he would otherwise. “You have to realize about my situation, most people don’t look beyond appearances,” he said. And if there’s one thing that matters when you’re homeless, according to Bert, it’s appearances. The minute the facade cracks and reveals his struggle, no one wants to be around you. No one wants to see it. People kick you out of places; they can tell you don’t belong anywhere. In talking with Bert about not just phones, but his life in general, I realized he’s someone with a clear-eyed inventory of his scant resources. And he maximizes them with an eye to maintain appearances. Within that ruthless calculus, a phone was more important than his car, which he sold after the winter and didn’t need to sleep in as a last resort. And besides, he said, cops are on the lookout for people sleeping in cars – it’s not as practical as you think. He used the car money to save for his phone bill, as well as a cheap $30-a-month membership to a local 24-hour gym in a central part of town, which gives him regular access to a hot shower and a place he can go late at night if he needs. He knows that sounds ludicrous, but says nothing marks a homeless man more than pungent body odor and an unclean appearance. You could have all the iPhones in the world with you, he said, but if you don’t have a regular way to stay clean, that’s the most dangerous thing of all in a precarious situation. Nothing gets a homeless person kicked out faster, rejected from a job instantly or denied housing than looking dirty. He kept repeating, “Dirty ain’t dignified.” It’s often that dignity that Bert fights so hard to maintain, even at the expense of other things – but definitely not at the cost of a cell phone. Bert’s ability to stay afloat and even keep up his personal dignity sheds light not only on how central phones are to our lives – no matter how poor you are – but also the world’s poverty of generosity and compassion. For every great example of helping others – such as the Reddit user who found a Chicago homeless man and delivered a care package to him – there are countless others who slip through the cracks, who walk in through doors of public places, face stares of cold evaluation and wonder if they’ll be kicked out. Bert lives assuming that people’s generosity and compassion are limited to a certain point – and once you push past that point, you’re lost beyond all help. Despite his situation, he’s a proud man, but burdened with the “double consciousness” that marginalized people often have – able to see himself both through his eyes, and through the eyes of how others would judge him. And it was clear that the discrepancy between the two distressed him, and much of his survival strategy tried to bridge that gap. I saw Bert only a few times after our first conversation, though we never did talk as in-depth. Sometimes he let me buy him a coffee refill, though he wanted to buy the first cup himself. But after a few months, I didn’t see Bert anymore, and I’m not really sure what happened to him. Did he finally pull himself out of his “temporary condition,” as he called it? Or was he like countless others who slipped through the cracks into the shadowy netherworld of genuine destitution and poverty, becoming one of the “unsheltered”? I just don’t know. He may still have his own phone number, but he remains out of reach, lost somewhere in a world where social ties are tenuous connections, no matter how many devices we have. 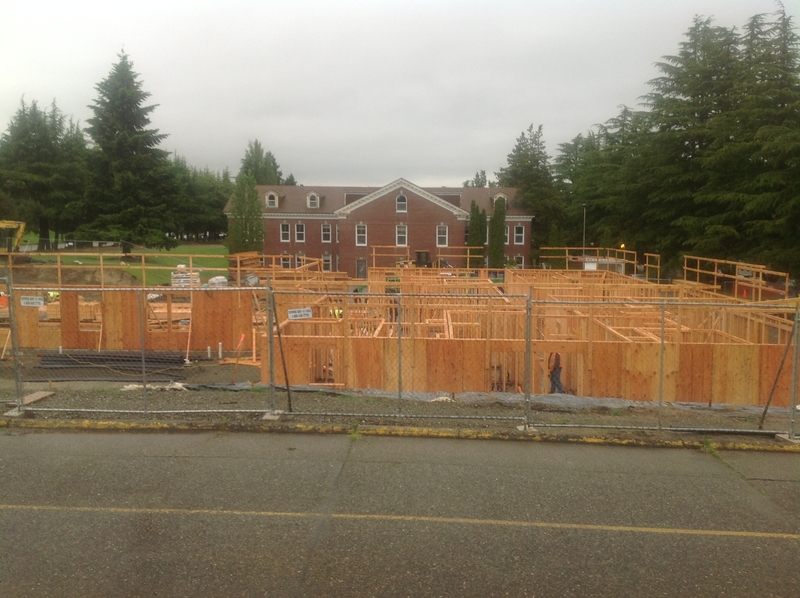 The final phase of Solid Ground’s housing development at the former Naval Station Puget Sound is taking place along Sand Point Way and just to the east of our Brettler Family Place. Building 5, now being framed in the area just south of the long brick historic barracks building, contains five family homes as well as housing for 33 single men and women. Building 4, which is nestled into the southeast side of Brettler Family Place, contains 16 homes for families. When the facilities are completed in December, Solid Ground will be operating 99 homes for formerly homeless families and 75 for formerly homeless men and women on the campus. All residents receive supportive services to make the Sand Point campus a a model stepping stone from supportive housing to long-term personal stability. Building 4, view from the north; this meadow will eventually be turned into a playground for the 200 children who will live on site. For more information, go to our website. 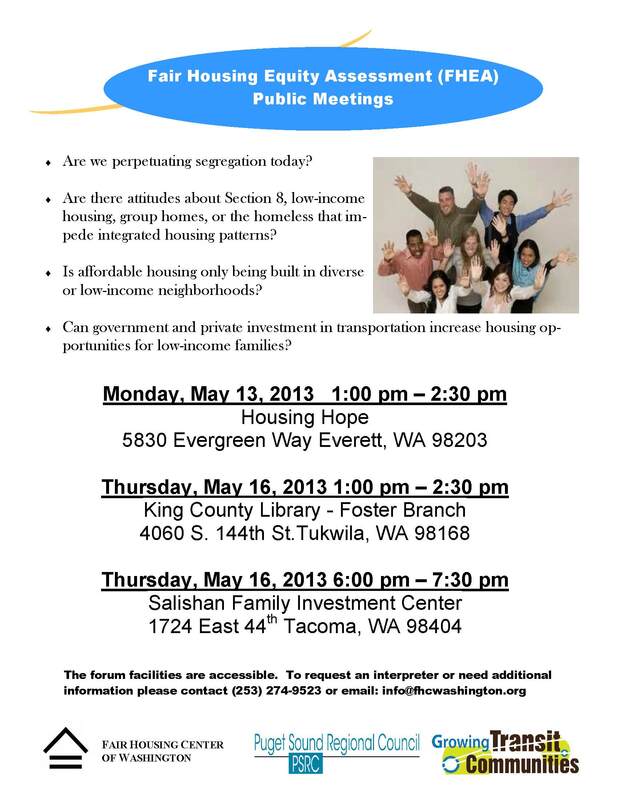 Your input needed at Fair Housing Equity Forums! The Puget Sound Regional Council, in tandem with the Fair Housing Center of Washington, is gathering information on barriers to equal housing opportunities with a special focus on the major transportation corridors in Snohomish, King and Pierce Counties. This Fair Housing Equity Assessment is part of the Growing Transit Communities’ three-year project to ensure equity along transit lines. We need your help! Are we perpetuating segregation today? Are there attitudes about Section 8, low-income housing, group homes or the homeless that impede integrated housing patterns? Is affordable housing only being built in diverse or low-income neighborhoods? Can government and private investment in transportation increase housing opportunities for low-income families? See flyer for meeting locations and times.